Then I bought a lamb. I filmed it during its birth, its life, and while it was being slaughtered. I stood face to face with the essence of this biblical theme: an innocent animal, barely half a year old, is brought to the slaughter without resisting, without having done anything wrong. Next I had the lamb stuffed. I built an altar of newspapers, piling up the inability of human beings to live in peace. Unfolding the papers I found this title: ‘Man is capable of anything.’ It was an article about the Holocaust. The moment the lamb put its head next to this title and the photo of Auschwitz it became to me a touching icon of Jesus himself, who voluntarily gave his life as a blameless and everlasting sacrifice. 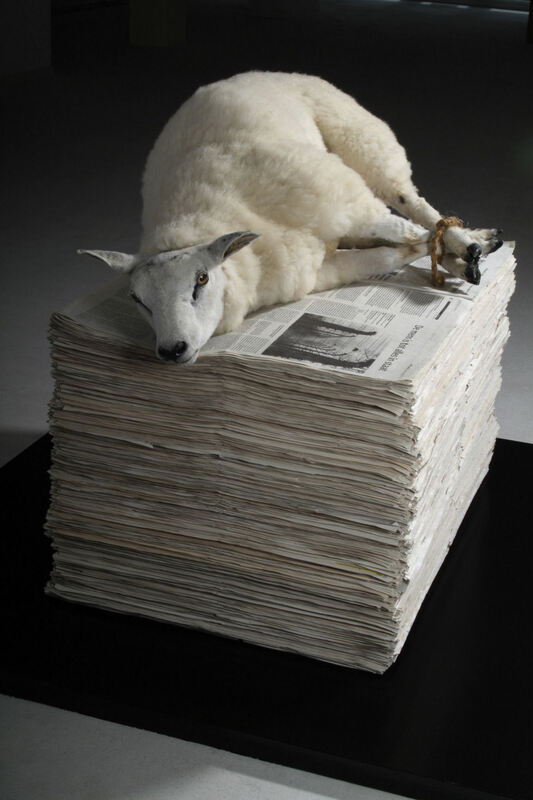 Willem Zijlstra: Agnus Dei, 50x85x62 cm, stuffed lamb, newspapers, 2005.